Mindika Moments: FLAG CAKE FOR THE 4TH! 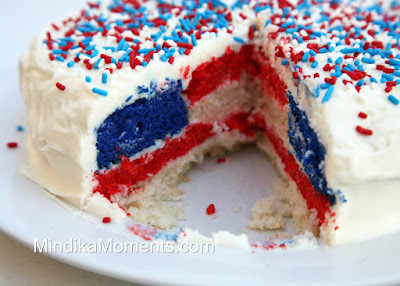 FLAG CAKE FOR THE 4TH! I'm totally making this (correction...made this) for out 4th of July party! I hope everyone has a wonderful, fun and safe holiday weekend! Thanks Redheaded Recipes for the idea and thanks 17 and Baking for creating the cake in the first place! Very creative and fun! Thanks to my good friend Lisa for taking this picture! ah man, I missed that cake! Seriously sad about it. looks delish!